With the days of ‘white water contracts’ almost a distant memory and signs of improvements in milk prices, it is becoming increasingly important to understand the details of contract changes in order to get the most from your milk contract. This was the message from Hefin Richards of Profeed Nutrition Consultancy, speaking at a recent AHDB Dairy event, held in Llandyfaelog, Carmarthenshire. If on a cheese contract, yield and quality are driven by milk protein because the higher the solids, the more cheese can be made from a given volume of milk. Mr Richards said: “Consistent fat and protein levels are wanted by high quality cheese makers but there are natural fluctuations in protein levels between herds and seasons. In June and July, national average butterfat percentage will be at its lowest. Butterfat percentage naturally increases over winter and protein peaks during autumn. For those with maize silage, this year has produced some excellent high starch crops which need time to fully ferment and stabilise, but farmers will give an opportunity to pull back the quantity of supplementary cereals fed in many herds from Christmas onwards, said Mr Richards. He said: “Ration balance is critical. For example, under-feeding protein alongside good quality maize will limit production and margin opportunity. “If you are not paid for milk protein, there is no benefit to specifically feed to push it, but remember, milk protein is a good barometer for general cow health and energy status. “For those looking to increase milk protein, including slowly degradable starch in a balanced diet is the key. Caustic treated wheat remains the most reliable and effective feed for milk protein in my experience, followed by alkali treated wheat, crimped and then rolled grains. “Maize grain and starchy maize silage will also have a positive effect, as will chopped fodder beet, which provides rumen microbes with a steady supply of sugar to balance rumen degradable proteins. “Milk protein is driven by energy, not protein, so if you are focusing on milk quality, it is better to focus on getting more starch in safely than feeding more protein. If enough fermentable metabolisable energy is fed, more microbial protein will be produced in the rumen, so less bypass or undegradable protein will be needed. There may be scope to reduce total protein use and improve its efficiency by using protected amino acids – usually methionine to more closely match supply to requirements. The economics have to be carefully considered but it may well become more commonplace in the future. Butterfat content now contributes significantly to milk price on most contracts, Mr Richards said. Milk fat content is depressed by low fibre and unsaturated fats, and spring grass is high in both. In winter diets, keep an eye on acid load and starch levels, since even mild rumen acidosis will have an immediate effect on fibre digestion and ultimately milk fat synthesis. Rumen buffers and yeast can be used tactically to improve rumen health and potentially drive fat and protein output. However, a well-balanced, structured diet and plenty of opportunity for cows to lie down and ruminate should always be the aim. Mycotoxins are another potential risk factor and where there is evidence or strong suspicion of their presence, the use of a proven mycotoxin binder is worthwhile. Oil inclusion in the diet also needs careful consideration. 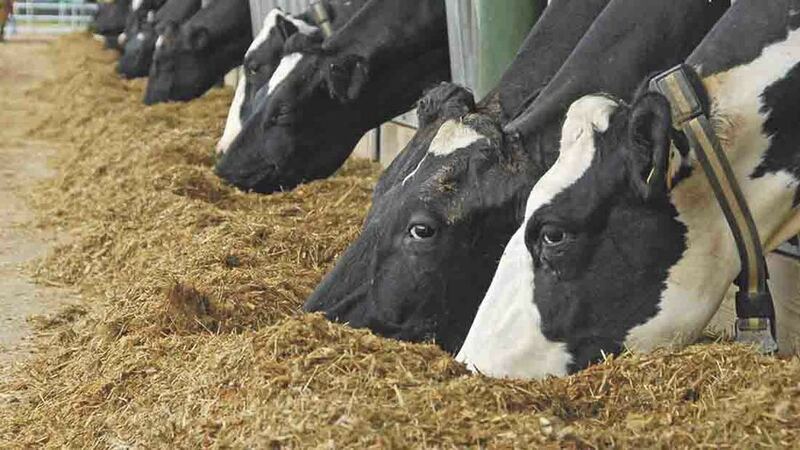 Too much oil will suppress rumen function and limit fibre digestion. Unsaturated oils, such as those found in cereal by-products such as brewers grains and corn distillers can have a negative effect on milk fat content when fed at high levels. “Saturated (C16) fat is a reliable, immediate, but expensive butterfat fix. This should not be seen as a long-term solution due to cost and also because some milk buyers do not allow its use on environmental grounds.